Can a stray coin stop your cell phone from charging? Texas Instruments explains how FOD lodged between the transmitter and receptor can prevent wireless devices from receiving an electrical power, in two videos: Wireless Power 101: FOD Introduction and Wireless Power 101: FOD Lab Session. What happens when you let your smartphone fall into your seat mechanism? It isn’t pretty for your phone or aircraft safety. Aerospace manufacturers are getting smart by designing storage spaces for phone owners flying in premium class. It’s going to get crowded up there. New applications for certification as a commercial drone pilot are pouring in, after the FAA loosened up requirements. As a result, the agency expects that well over a half-million new UAV’s will take to the skies within a year. Yes, you can crash a Huey into a mountainside with a dirty piece of rag. A pilot suffered minor injuries during a logging operation after a towel somehow ingested itself into the inlet guide vanes, according to an NTSP investigation of the 2015 incident. The FOD Control Corporation now offers custom-designed temporary berms to contain hazardous or environmentally-sensitive spills. An AA-5B prop plane brought down by paint chips? If you're an aircraft mechanic, read this Safety Alert from the National Transportation Safety Board. Includes recommended practice for controlling FOD during MRO activities, a collection of failure examples and a list of informative links. Take a walk through Brentwood Industry’s 12,000 square foot ISO Class 7 cleanroom at its Reading, Pennsylvania manufacturing plant, with custom thermoforming, injection molding, airlock entrance to maintain air pressurization, dedicated gowning room, and a segregated material loading bay. Don’t you just hate it when your airliner skids across a rain-soaked runway and into the nearest control tower? Starting in October, the Federal Aviation Administration will require that federally-obligated airports use the new TALPA procedures to assess the safety of runways that are not dry. Review these online resources for improving air operations during inclement weather. The United Kingdom is confronting a surge in unmanned aerial vehicles (UAV’s), which nearly collided with manned aircraft more often in the first six months of 2016 than during all of 2015. British authorities are trying to assess the potential dangers of a drone strike, as compared to the more common bird strike. OK, you've dutifully picked some FOD off the ground. Now what do you do with it? These rugged FOD Bags offer a flexible, portable and lightweight place to store found debris for later disposal. Is the F-18 Safer than the F-35? The fighter wars are raging again, only this time in the press room instead of the skies. Boeing’s chief F/A-18 Super Hornet test pilot makes his case for the two-engine fighter being less vulnerable to catastrophic FOD incidents than the single-engine F-35 Lightning. There’s another player in the global aviation market for FOD detection sensors. ArgosAI Technology, based in Ankara, Turkey, has developed an artificial intelligence system that analyzes images of runway debris, then transmits the data to airport staff for action. Image © Alper Cuğun. Some rights reserved. QA inspectors at the Shaw Air Force Base's 20th Fighter Wing do more than just look for debris in their F-16CM Fighting Falcons. They also shadow the aircraft’s maintainers, watching for noncompliant behavior that can lead to unsafe work habits. Watch this fascinating video of an Air Force sergeant describing the inner workings and sucking power of an F-15 Eagle engine. Aviation Week’s new photo slideshow on the dangers of FOD features concise information on safety issues and several potential solutions. It also features two of our equipment lines, the FOD-Razor™ Airport Runway Sweeper and the 55-Gallon Drum Conversion kit. The FOD Control Corporation now supplies hazardous materials storage equipment! From indoor chemical cabinets to outdoor safety lockers to 55-gallon drum sheds, we will keep your facility safe. Investigators have discovered eagle residue on a Cessna 172 that crashed near Birchwood Airport in Alaska, killing the pilot, a retired National Transportation Safety Administration investigator, and three other occupants. Harrisburg International Airport has a fun 2-plus minute video demonstrating proper ramp procedures for vehicle, baggage and other employees working around commercial aircraft..
Airlines and their passengers experienced delays of over an hour when an aircraft dislodged chunks from a runway at LaGuardia Airport, creating an opening large enough to fit a person. Image © Patrick Handigan. Some rights reserved. Environmental regulations requiring ships to use low-sulphur fuel is damaging their engines. The culprits are tiny metallic particles called “Cat fines” used in the fuel refining process. Ready to improve your hazardous materials safety program? We are expanding our product catalog with fire-rated outdoor lockers, indoor chemical cabinets, drum sheds, and temporary fuel-spill berms. Image © Justrite Mfg. Co, LLC. All Rights Reserved.. It may be the tail end of the holiday season, but don’t expect Santa to shove a wad of extra cash into your airport’s FOD control budget. While the nation’s aging airport system requires numerous infrastructure upgrades, there’s not a lot of new money coming in. The new Congress is unlikely to increase FAA funding and may even cut it. Efforts to raise the Passenger Facility Charge (PFC) cap have so far proved fruitless. Compared to major airports overseas, the US is falling behind. When funds are hard to come by, a good FOD program manager learns how to make do. Maintain your existing equipment as well as you can for as long as you can. Every month that you spend a few hundred dollars to keep that old machine running is another month that you don’t need to shell out many thousands of dollars on a new one. Milk your suppliers for every possible ounce of tech support; they want your business, so let them earn it. When it does come time to buy new equipment, get proactive and bring up creative financing options. If they want the sale, they will work out with you a mutually-acceptable cash-flow plan. If your facility has always made that extra effort to pay its bills on time, now is when that effort pays off for your program and staff. Be a smart buyer. Write up a detailed list of desired performance specifications and include it in correspondence, bid solicitations, and contracts. Ask your supplier for their product’s specifications, other facilities where it is currently deployed and, if possible, an on-site field demonstration. The last thing you want to do is purchase a hundred indoor FOD cans and then watch them rot in the outdoor sun. Is your facility planning a construction project? Most construction contracts require that the contractor keep the work area clean of FOD, so the contractor may have to purchase equipment, such as sweepers and barriers, to fulfill that requirement. Cut a deal with them to transfer ownership of that equipment to you once the project is complete. They recoup a portion of their original purchase costs and you obtain equipment for a portion of its market value. Do you have a GA airport or other facility with a relatively light surface sweeping program? A secondary market exists for used sweepers, which can save you a considerable sum. Even better, get in touch with suppliers and ask if they have an old demo unit that they would be willing to let go of for a nominal sum. This is a win-win situation—they pick up a few dollars and you pick up some extra hours of sweeping. Performance incentives to motivate staff to maintain safety standards need not cost and arm and a leg. A logo jacket or a dinner for two goes a long way to show appreciation. One great way to jazz things up is to let the staff select the type of reward, within the budget that you set, before you award it. Remember, you are not rewarding employees for following the rules. You are thanking them for making the personal decision to treat seriously their own safety, as well as the safety of their colleagues and customers. Are Wildlife FOD Hazards Increasing? Our grandparents used to think of coyotes as reclusive creatures wandering the western deserts and woodlands. Not any more. Today these hardy and picturesque predators are just as likely to live in urban areas throughout North America, helping to control the local population of rats, mice and the occasional little yap dog. In October, Gerald R. Ford International Airport in Michigan had to delay several flights after an airliner struck one on a runway. Over the past quarter century, wildlife strikes on civil aircraft in the USA have increased six-fold, from about eighteen hundred in 1990 to over eleven thousand in 2013. The cost to civil aviation, especially general aviation, runs into the hundreds of millions of dollars annually. Not surprisingly, populations of large birds, coyotes and deer – which, as a trio, cause the most damage – have increased over that same time period. While minor fluctuations do occur, such as a recent deer decline in some regions, the overall trend is for more birds and animals living and feeding closer to urban areas, including your airport. When new building or agricultural developments encroach on their traditional habitats, wildlife will adapt as best they can, including migrating to the wide-open spaces of airport property. They also feed at agricultural, fishing, sporting, wildlife refuge, industrial, waste-disposal, and other facilities that expose organic matter to the elements. The FAA generally recommends wildlife-attracting land uses should not be created within five miles of an airport. Given the powerful local constituencies that support such land uses, you will have a difficult time removing existing projects. But you can still make your voice heard whenever a new land use is proposed that may impact safety. Regardless of the causes, it is undeniable that the summers are getting hotter and the winters are getting wilder. Changing climate patterns can also shift populations, because most species are used to living within a limited range of temperatures and precipitation. If that range changes, they may migrate away from your airport to a different region, only to be replaced by new species that like the new weather. While nobody can predicting the weather months in advance or how it will affect complex ecosystems, you can still take practical steps to stay ahead of the curve. Contact colleagues at airports with weather similar to the patterns that you are now beginning to experience. Ask them about the birds and animals that normally cause problems there and how they deal with it. Also get in touch with your local university's wildlife experts to discuss recent changes in local populations and get their thoughts on what the future might hold. If you want to learn more and help your colleagues to learn more, participate in the FAA's voluntary Wildlife Strike Database program. You can report a strike that occurred at your airport, search the database for past strike reports, and read the agency's annual report on the topic. 3 Easy Steps to Raise FOD Awareness Right Now! Keeping your employees on the lookout for foreign object debris or damage (FOD) can prove challenging in a busy work environment. Try these three proven methods to encourage awareness and a strong safety culture. While the examples focus on airport environments, you can easily apply the same principles to manufacturing facilities. 1. Provide clear goals and instructions. FOD control training sessions involve more than just instructing staff to “pick up after yourself.” Each job description creates its own unique potential for discovering – and creating – potentially dangerous debris. How roughly a Ramper handles cargo influences how many broken suitcase handles, torn ID tags, and ripped labels litter the ramp. The route and speed of a driver towing a runway sweeper influences how efficiently it sweeps. Likewise, the Ramper is in a perfect position to follow “clean as you go” procedures during loading operations. Ground vehicle drivers can be trained to visually scan the pavement during routine operations. Assess each job description, then create a short and specific list of instructions for that employee or team. 2. Bring senior management aboard. Employees pay attention when the C-suite pays attention. Your top executives must set an example by personally encouraging awareness and compliance. For example, in the US Air Force – which has the best FOD program in the world – oversight of an air base's program is normally performed by the Vice Wing Commander, who is a colonel or general and the unit's second-highest ranking officer. Typically, the VWC delegates day-to-day activities to a career sergeant with ground maintenance experience, relying upon his or her reports and recommendations when making command decisions. In a civilian facility, program oversight normally falls to the safety or operations manager or, in a small GA airport, the airport director. Regardless, a senior manager with supervisory authority must hold ultimate responsibility. 3. Hold a FOD contest. Most folks don't think of picking up garbage as fun, so let's make it fun. Challenge staff to create safety posters and distribute copies of the best designs. Lead a round of applause to the employee who brings in the heaviest trash bag during cleanup. A popular and productive contest is the Golden Bolt hunt. First, management colors a bolt with gold paint and hides it. Then, employees perform a “FOD Walk,” visually sweeping an area for FOD, collecting it as they go along. Whoever finds the Golden Bolt wins. During staff meetings, award prizes to employees who collect the most debris, design the best poster, or locate the hidden bolt. They need not be expensive and might include a dinner coupon, gift card, or framed certificate of achievement. You are not “buying” responsible behavior from your employees. You are recognizing their personal decision to actively support the safety of their company, co-workers, and customers. Looking for formal training materials? 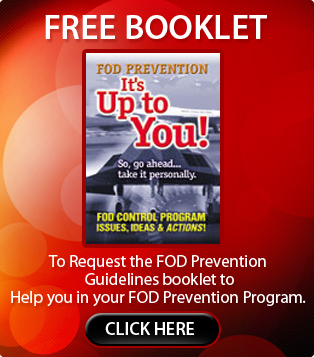 Visit FODProgram.com for a list of online courses that will teach your employees how to practice responsible FOD awareness and control.